NEW ORLEANS — In support of Super Bowl XLVII, a team of federal, state and local law enforcement agencies begin maritime safety and security operations on the lower Mississippi River. Response boats, patrol vehicles and enforcement personnel from more than 16 law enforcement agencies will conduct maritime security operations in the downtown New Orleans area and at the Port of New Orleans. All agencies will work together within a unified command, lead by the Port of New Orleans Harbor Police Department and the U.S. Coast Guard, to provide a coordinated safe and secure environment for Super Bowl participants and the general public. This level of interagency coordination for the Super Bowl is the culmination of several months of planning involving all law enforcement agencies. The Super Bowl marks the first multi-agency operation to be conducted in the Port of New Orleans Maritime Security Operations Center, one of the five new maritime security interagency operations centers located on the lower Mississippi River. Sunday, Feb. 3, beginning after the conclusion after the Super Bowl and lasting for approximately 45 minutes. The Coast Guard emphasizes the importance of well-rested crews and vessel operators and continues to stress the value of wearing a lifejacket while working on deck in light of one death and two close calls this crab season here in the Pacific Northwest. Proposed fishing vessel safety training schedules can be found by visiting www.amsea.org. The same NOAA weather and climate satellites that accurately tracked Hurricane Sandy’s path in October also played a key role in rescuing 263 people in 111 emergencies in the United States and surrounding waters in 2012. Since NOAA’s seven operational satellites circle the globe or sit above the United States, they also carry instruments to detect distress signals from emergency beacons carried by shipwrecked boaters, as well as downed pilots and stranded hikers. In addition to their role in weather prediction, these polar-orbiting and geostationary satellites are part of the international Search and Rescue Satellite-Aided Tracking System, called Cospas-Sarsat. This system uses a network of satellites to quickly pinpoint the location of the distress signals. ● Alaska had the most rescues with 45, followed by 38 in North Carolina and 25 in Florida. ● 14 people were rescued from the tall ship HMS Bounty which was caught in a torrent of waves more than 200 miles off the North Carolina coast. ● Three people were rescued after their sailboat rolled in heavy waves off the San Francisco coast. ● In the Gulf of Mexico, five people were pulled to safety when their fishing boat began taking on water. ● Seven were rescued 400 miles west of Honolulu after their fishing boat caught fire. When a NOAA satellite finds the location of a distress signal, the information is relayed to the SARSAT Mission Control Center based at NOAA’s Satellite Operations Facility in Suitland, Md. From there, the information is quickly sent to a Rescue Coordination Center, operated either by the U.S. Air Force, for land rescues, or the U.S. Coast Guard, for rescues at sea. Since 1982 when the program was started, Cospas-SARSAT has been credited with supporting more than 30,000 rescues worldwide, including 6,999 in the United States and its surrounding waters. Owning a SARSAT device is only the first step to ensure one’s safety. It is imperative that the owner register their beacon with NOAA. This gives critical information to responders including the owner’s name, personal and family member contact information, and the type of vessel or aircraft. Registration is required by law and may be completed online at http://www.beaconregistration.noaa.gov/. In 2012, there were more than 37,000 new registrations, a record number for one year. NOAA’s registration database has more than 360,000 registered beacon owners. NOAA’s mission is to understand and predict changes in the Earth’s environment, from the depths of the ocean to the surface of the sun and to conserve and manage our coastal and marine resources. Visit us at: www.noaa.gov and www.sarsat.noaa.gov. Now that the holidays are over and it’s too cold to enjoy boating to its full extent, why not keep your boating skills sharp through reading and re-education. 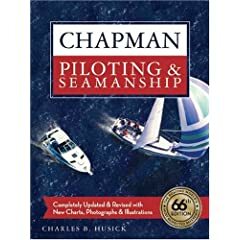 For some heavy reading, the consummate compendium on boating and seamanship is “Chapman Piloting,” the 66th edition published by Hearst Marine Books. This comprehensive resource is recommended by both the U.S. Power Squadron and the USCG Auxiliary as a reference. “Chapman Piloting” covers all the basic topics of boating and seamanship (weather, handling, docking, anchoring, knots, etc. ), a broad review of related information, and the etiquette of proper boating, including flag display and dockside behavior. I would recommend this publication to any boater, new or experienced, who is interested in pursuing the details of boating and seamanship. It makes a complete library almost by itself. If you have been following the BoatSafe Blog, you know that I have published a couple of articles warning of the dangers of relying solely on GPS as your primary navigation source. Why not use the winter to learn or relearn additional navigation skills, to get you from one place to another without depending on GPS? The Nautical Know How navigation course is a combination of a printed text/workbook for home study, sample and real time chart work, online animated demonstrations and testing, and email instructor assistance. It’s really a book about life, in which the author relates what he learned through his experiences with small boats while growing up on the south shore of Long Island, and how those experiences guided him later in life. In a questionnaire sent three years ago to all owners of Nonsuch yachts, which generated some 300 responses, this book was mentioned as a favorite more than any other. Owners of larger boats have their bibles, but, until now, outboard boaters have been neglected. This comprehensive manual shows you how to go places and do things you never thought possible in a small outboard motorboat. Covers all the popular types – and some alternative craft – as well as methods that might change your entire boating outlook. Ever wondered about the origin of big-wig, flogging a dead horse, mind your P’s and Q’s, or three sheets to the wind? These commonly used colloquialisms all have nautical backgrounds and entertaining histories. 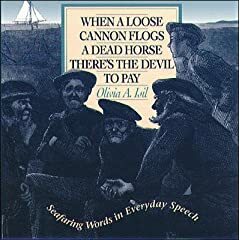 This collection of more than 250 of these fascinating words and phrases also includes yarns, legends, superstitions, weather lore, poetry, rhymes, songs, and more. 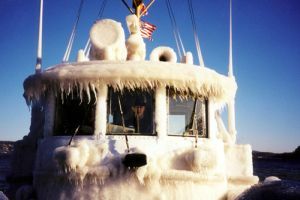 The Coast Guard is advising boat owners about the danger posed to their vessels by the recent and continuing snow storms and severe icing. 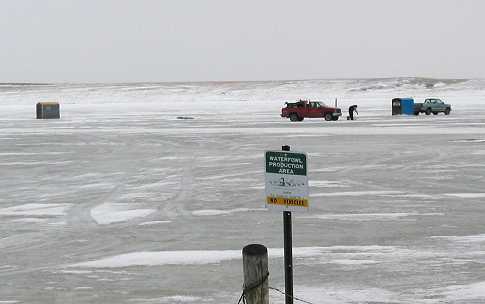 The Coast Guard has responded to several incidents recently where recreational or small fishing vessels sank at their pier or mooring due to excess weight from snow and ice. With the accumulation from this week’s significant winter storm, more vessels may be at risk. The fact is that some things just disappear and no one knows where they go. There must be a stash of single socks and gloves somewhere in the heavens. The same thing happens over time on your boat. So the winter season is a good time to check your onboard tool kit and spare parts to make sure none of those have disappeared into sock and glove heaven. That will give you time to replace what’s missing before your spring boating debut.